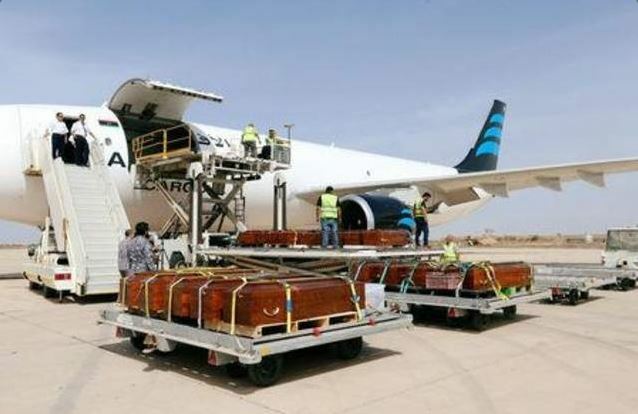 The 20 bodies of Egyptian Copts murdered by ISIL in Sirte were returned to Egypt yesterday (Photo: LANA). The remains of 20 Egyptian Copts ceremoniously murdered while being recorded on video by the terrorist organization ISIL during its control of Sirte, were returned to Egypt yesterday. Their remains were flown from Misrata airport after completion of the relevant procedures by Libyan authorities, Libyan state news agency LANA reports. At a press conference in Misrata, the coroner handing the case put the death of the Egyptian Copts at between the end of 2014 and the beginning of 2015. He indicated that the announcement by ISIL of the implementation of the massacre in mid-February 2015 was not the actual date of their killing. It will be recalled that as part of its media propaganda, the terrorist organization ISIL had published video footage of the killing of the Egyptian Copts during its control of the city of Sirte in 2015. The bodies of the Egyptian Copts were discovered on 7 October 2017.